Remember watching VHS tapes rewind? Like when Jack and Rose are alone in freezing waters but are saved by the magically appearing Titanic, which bursts up from the bottom of the sea only to take them back to Southampton. Or like watching the truce between the Montagues and Capulets slowly break apart by the spontaneous re-animations of Romeo and Juliet. This time, we at Indiana Review are asking for you to not only reverse a story, but also do it in under 140 characters. Take a classic tale and tweet it from finish to start. Remember to always hashtag the title of the work as well as the official hashtag #IRrewind. After the deadline, October 17 @ 12 PM EST, the IR team will pick out our one, favorite rewind, the writer of which will receive free entry into the 2016 Fiction Prize and an IR Prize Pack. While there will only be one winner, we will also be awarding several runner-ups IR Prize Packs as well. 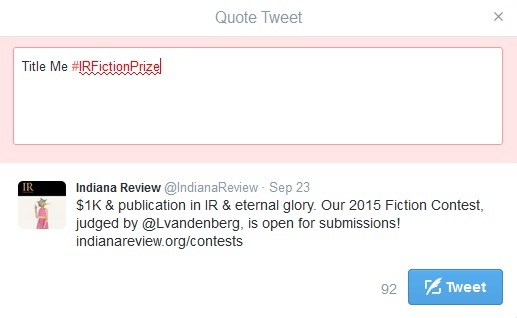 This will include the glorious privilege of being re-tweeted and mentioned in future blog posts from Indiana Review. Good luck and remember to be kind and rewind! 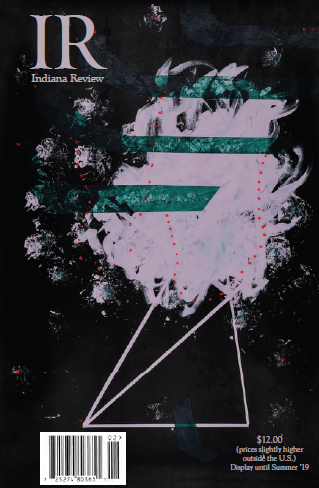 2015 Poetry Prize Exquisite Corpse! 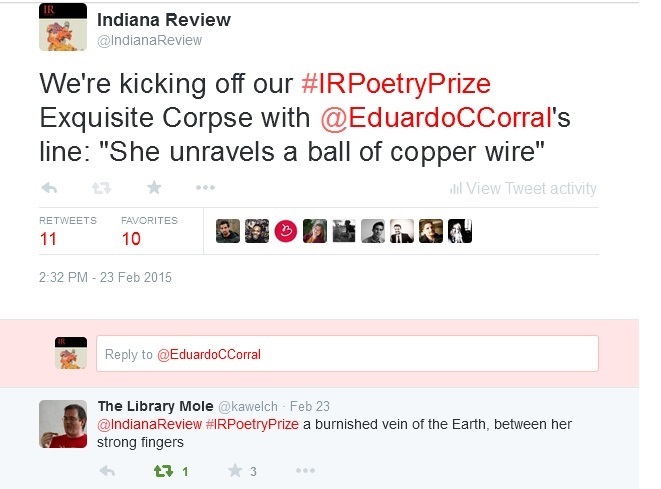 Our #IRPoetryPrize Exquisite Corpse is now closed–thank you to all who participated! We’ve enjoyed reading the lines you’ve come up with and seeing how much inspiration you got from that starting line. We’re still accepting submissions for our 2015 Poetry Prize, judged by Eduardo C. Corral, who wrote the line that started our Exquisite Corpse. Important update! 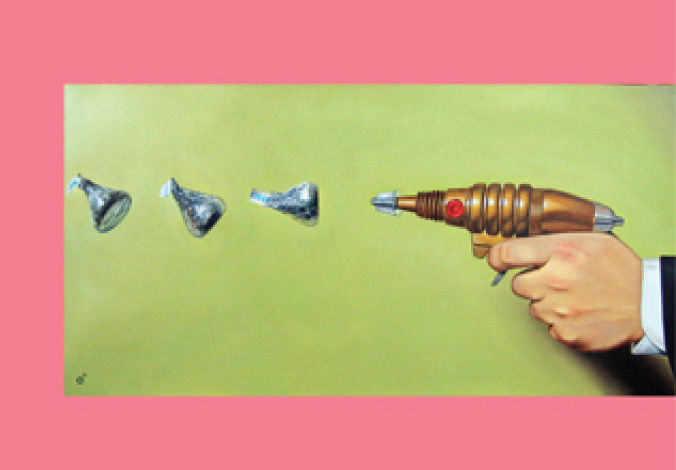 We have extended the deadline for our 2015 Poetry Prize to April 15th, 2015. You can find the guidelines and submit here. You can read all of the responses on our Twitter, but here are some of our favorites! Poetry Prize Twitter Exquisite Corpse! Our 2015 Poetry Prize is underway! To celebrate, we’re going to play a little game of Exquisite Corpse on Twitter. Exquisite Corpse is a game of collaborative storytelling in which each player contributes one line of a poem at a time. On Twitter, the challenge will be keeping each line within 140 characters. Here’s how it’ll work: We’ll post the first line of a poem, written by our very our Prize judge Eduardo Corral, on Twitter, with the hashtag #IRPoetryPrize. Then you, our lovely Twitter friends, will reply to that tweet with the next line of the poem, and the next contributor will respond with the next line, and so on. Remember to use the hashtag #IRPoetryPrize so that we know you’re participating! We’ll retweet your responses, and the best lines will be posted right here on the Indiana Review blog! So let’s make something. Check out Eduardo’s first line here!